Sea Transport Solutions is pleased to announce that the brand-new STS-Designed RORO passenger and cargo ferry dubbed ‘The Galleons Passage’ will be operating the sea route between Trinidad and Tobago after its purchase this past January. 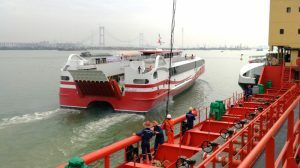 This 74-metre catamaran has an aluminium superstructure comprising a steel hull design, a capacity of 700 people and up to 100 vehicles, a maximum speed of 22 knots and, due to its 2.75 metre draft, it can berth anywhere at the Port of Spain harbour including the ferry terminal without dredging. The Galleons Passage, whose name was inspired by the route it is set to run of the same name, is expected to arrive from China sometime in mid May, 2018. Imbert also stated that the new vessel is intended to assist with the sea bridge while the other passenger vessels are drydocked for repairs but did add that the vessel is ‘perfect’ for the Toco-to-Tobago route as that journey will take only one hour. The naval architects and ship designers at Sea Transport are confident that The Galleons Passage will meet the high expectations held by both the T&T Government and the route’s future passengers. Fore more information on Sea Transport’s ferry designs, please click here or get in touch with our head office.